Left: Rachel Mason, Mobutu Sese Seko from The Songs of the Ambassadors, 2004–. Performance view, NADA Art Fair, Miami, 2007. Photo: Matthew Spiegelman. 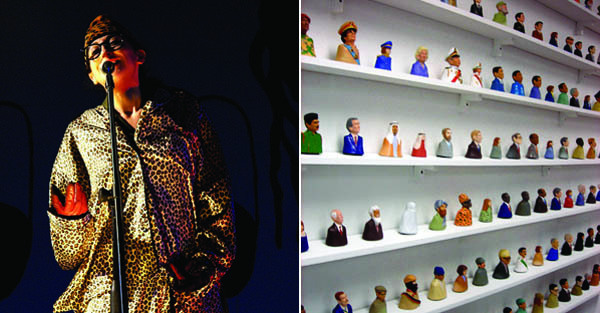 Right: Rachel Mason, The Songs of the Ambassadors (detail), 2004–, mixed media, dimensions variable. Installation view. The artist and songwriter Rachel Mason has performed at the Kunsthalle Zurich, the Park Avenue Armory, and Art in General, among other venues. Here she talks about The Songs of the Ambassadors, an ongoing work involving miniature porcelain busts of political figures, self-portraits, and her music. The project is currently featured in the exhibition “LifeStories” at the Museum of Contemporary Art Detroit, which closes on March 27. THE SONGS OF THE AMBASSADORS began in the winter of 2004, when I saw a TV news report about the death toll in Iraq. I waited to see more, but the newscast ended abruptly. Suddenly a huge throng of people were cheering at the two warring teams facing off on an arena floor––a football game. I switched channels to try to hear more about the war but the game was on every one. I wondered: How many were dead? Three thousand? I couldn’t remember. I tried to recall when the war started. What was I doing to prevent it? I went to some protests, but this was just one war. What about the others? How many wars happened in my lifetime? Then I began to really think a lot about President Bush. What must be going through his mind? What was his world like? How was he deciding what he was deciding? What could I do about anything? And later, I started to fantasize that I could play with all of these world leaders like dolls. If they were small enough for me to hold in my hands, maybe I could have a better sense of who they were and what had happened during my lifetime. I love collectible sets, like the plates of all the presidents. If I had a special edition set, I would have porcelain busts of the leaders of countries at war and I would play the part of an ambassador to each conflict. I would wear their costumes so that I could sit with them and be an ambassador. From 2005 to 2009, I sculpted my life in wars. I chose conflicts big and small for each year of my life, and I began writing and recording songs to go along with them. The first album was a collaborative effort with fourteen friends whose lyrics I set to music. The artist Michael Queenland wrote a two-part song about the president of Burkina Faso. Jennifer Herrema of the band RTX wrote about Guy Phillipe, the rebel leader of Haiti who tried to depose Aristide. The writer Emory Holmes II, whose poem about Mobutu Sese Seko is on the first album, once remarked, “In fiction you can express more reality than in nonfiction.” His words really prophesied what would happen with this project. In March 2007, I wrote to Manuel Noriega and sent him a picture of the bust I had made of him, and he wrote me back from his prison cell telling me to read his book. While reading his book, my ear became infected and I wrote the song “Se infecto mi canal” (My Canal Is Infected). We exchanged another letter just before he was transferred to France. I made a video in 2008 for My Chechen Wolves, a song in which Dzhokhar Dudayev, the fearless fighter of the small nation of Chechnya, challenges the Russian army. I used footage from YouTube, and when I put it back on that site it went viral in the Caucasus and I became involved in the cause. I attended a rally last December where I sang the song for a protest in Times Square against recent racial attacks on the people of the Caucasus.